The other day I looked around the house and realized the whole place was going to hell in a hand basket. It all started when I got a new fall jacket. Now this was no ordinary jacket, kids. It was a jacket I had fallen in love with at first sight but couldn’t bring myself to spend the money on. Then it went on sale…and I still couldn’t bring myself to spend the money on it. Then it sold out and I was sad I hadn’t spent the money on it. I ended up ordering a couple other things from the same store and when I went to check out online I noticed my beloved jacket was still sitting in the shopping cart where I had put it back when I was thinking and dreaming about buying it. Not only was it still in the cart but it was even cheaper than the original markdown. I double checked the website to see if it was still available and it still said it was sold out. I decided to check out with it in my shopping cart and see if the order would go through. And it did. And my sweet little jacket came in the mail a few days later. I might have danced around the kitchen for a few minutes. And then I had to find a home for it. 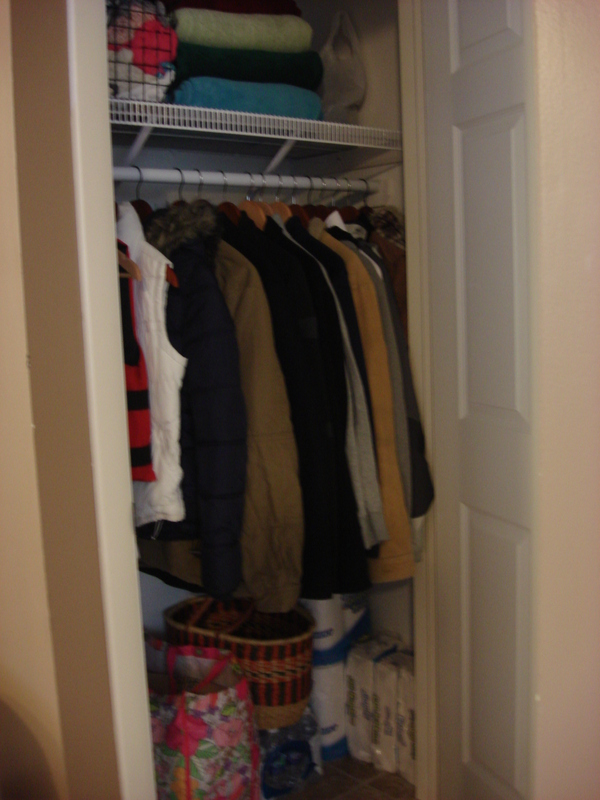 The coat closet was the obvious choice but the coat closet…oh my gosh the coat closet….was such a mess all packed full of nonsense and I didn’t think it was a suitable place to put my sweet little jacket. So, I decided to clean out the closet and make a nice cozy spot for the jacket. Who knew what cleaning a coat closet would start around here. This is what was living in our teeny, tiny closet. Furniture, car parts, the Christmas decorations from last year I never quite put away, and ten million other coats and jackets (hey, we live in New England—don’t judge me). 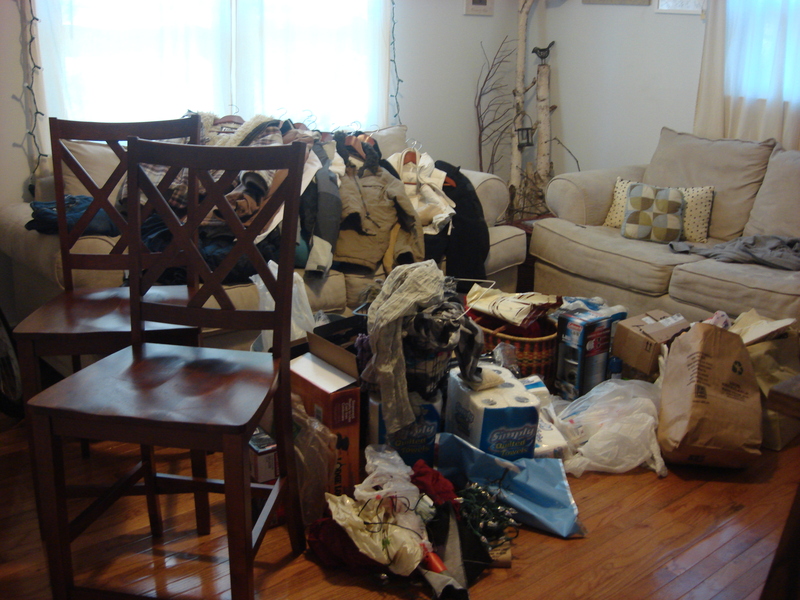 I pulled everything out onto the living room floor and reorganized the whole thing. I found a place for everything and only stuff that actually belonged in the coat closet went back in. I felt so refreshed and satisfied after that little project. It felt good to conquer a mess I had been avoiding and regain some control over this place. And I started noticing junk drawers that wouldn’t open or close right because they were too full of junk. I noticed cob webs because I never dust. I noticed how I can’t ever find anything because it’s buried in the basement or under one of the beds. I noticed a lot of things around here needing work—and in the process of cleaning all those things up, I noticed something else far more important. I noticed that the reason this place is an unorganized disaster is because I never really settled in here and made this place home. We bought this house a couple of years ago with the intention of only staying for three years. I’m the kind of person who doesn’t bother settling in if I know I’m going to move back out. I figure it’s a waste of time to put roots down and get attached if I’m just going to have to leave anyway. So as soon as I heard “three years” I stuffed everything anywhere it would go and kept telling myself that I would do a better job making a home once we got to the place we’re going to stay. But then I realized when I started going through things and getting this place organized that I’ve never really lived here. I’ve never really considered this little box with four walls a home. I’ve just been treading water and counting the days and minutes until I can get out of here and get on with life. And then, I told myself, then I’ll settle in and really start living in a place. But the problem is this is where I live—right now, today, this is my home. And it may be my home longer than I like. Our three-year mark is next March and we have nowhere to go as of yet. So the odds are I’ll still be here even after we had planned on moving out. I realized I’ve been wasting time and not really living just because I’ve already moved out of here in my head (actually, I never really even moved in). I’ve lived here for 2 1/2 years and I’ve never settled in and made this place home. It’s funny how you clean a coat closet and you realize you need to work on a million other things around the house, and while you’re working on those things you realize you need to work on more than just the house, and while you work on that you realize there’s more to this whole “not settling in” problem than just making a house a home. I realized along the way that there are a lot of things in life I haven’t really embraced because I don’t plan on doing them long-term. My job for instance. I’ve always known my job is temporary. I know I want to raise a family and when I do I want to stay home with them. There has never been any question in my mind that this is my long-term plan. That’s great…only I don’t have kids and I am working….and I’ve been working for years. But I’ve never really given 100% at work or fully committed to what’s before me because, again, in the back of my head I tell myself, “oh this is just temporary so who really cares.” I show up for work every day and do my job. And that is all. I come home from work and make dinner and keep this place clean. And that is all. I just do what I have to do to get by until I get to where I’m going. Only where I am is part of where I’m going. And I see now that just getting by until the next thing is not a very good way to live. It has made me pretty miserable actually. I’m miserable in this house because I don’t want to be here. I’m miserable at work because I don’t want to be there either. You put those two together and it equals me being miserable 90% of the time. Because I’m just getting by until things get better. But my life is today, not tomorrow—not yet at least. If I don’t start living in the present then I’m going to look back and realize I’ve let my whole life pass me by in my anticipation of the next best thing. With all this in mind, I decided it was time to really settle into our home and my job. I’ve been working on getting the house cleaned up and organized. I’ve cleaned out junk drawers, under beds, in closets, and everywhere in between. The more I do the more I realize needs to be done. I’ve also been getting the house feathered and cozied up. Darren and I finally tackled our bedroom. We painted the walls, replaced the carpet, and bought lamps, curtains, and a duvet. It’s so warm and cozy in there now. I’ve also been working on creating a cozy little nook in the guest bedroom where we can snuggle up to read and write. I’ll show you pictures of all these projects when they’re done and I have time to snap pictures. In order to finance all the work I’ve been doing around the house and to help me jump into work wholeheartedly, I’ve started working more hours each week. I’m full-time again for the first time in a long time and I’m actually enjoying my work more than ever. Of course working extra hours and using all my free minutes at home to tackle project has meant less time on here—but that has been good for me too. Being on the computer too much makes me restless and unhappy. You can only spend so much time reading about other people’s lives and looking at pretty pictures of things you want before it leaves you discontent and unsatisfied. Getting this place pulled together has meant walking a fine line between getting a few new things to make this house feel more like a home and letting myself get obsessed with new things just for the sake of having them. I really struggle with materialism. I struggle with always wanting more, more more. More clothes, more things for the house, more, more, more. But more things won’t make me happy. There is nothing wrong with having nice stuff, but “stuff” shouldn’t be the most important thing to me either. So now that we’ve completed some projects around here and this place is starting to feel like home, I’m taking a break from buying anything else for the house until after the New Year. There is plenty more I want to do. I have lots of plans and ideas and a whole list of things I would like to get but I need to step back from it all for a bit and just enjoy what we already have and what we’ve just done. If I immediately move onto the next thing then I’ll never stop and really enjoy what we already have. I have a cozy bedroom and a cozy little nook and for now those are the things I need to step back and enjoy before I move onto another new project. Anyway, That’s what I’m learning and doing of late. Our days have been filled with crisp blue skies and sunshine brought on by the cooler nights. Fall is teasing us and here on the last day of August, I’m ready to jump into September and fall and all the new life and adventures that come with my favorite season of all. Football is starting, lattes are coming back, and the whole world feels like it’s wrapping up in a cozy little blanket after a hot busy summer. I couldn’t be happier. This entry was posted in Home + Garden and tagged House & Home. Bookmark the permalink. Great lessons here. Thank you for sharing. Thanks a lot! WHY did I have to just read this now? Today is the day I was going to do exactly what you described, but I have been stalling on the computer reading other people’s lives, etc. So, now I have to get off and start picking my place up, organizing and throwing away… I felt guilty before, but NOW I really feel guilty… Thanks Kari! At least, can we please see a photo of your new Fall Jacket? p.s. your message was not lost on me… and never fear, your day will come. And to think it all started with a jacket that wasn’t sold out after all! Thank you for reminding me of some very important truths today. Oh, and I’d love to see a photo of the jacket! Love this post. You’ve got to enjoy the journey and the journey is “now”. Glad to hear I’m not the only one. Thanks for reading and leaving encouraging thoughts as always! Its not getting what you want, its wanting what you got. 🙂 Nothing like a little reorganizing and making a place more livable. Nice post. You have learned and passed on a great lesson. To be content and happy with what we have, to ENJOY life NOW instead of when everything is finally “perfect.” Making home, truly home..something a good many wives and mommies never do learn. Well done Kari. Thanks for being a great example of peace and contentment, mom.